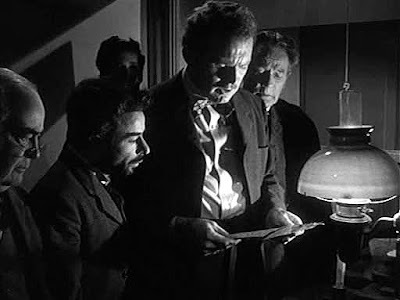 If there's a must-have in this selection of films, it is Samuel Fuller's paean to newspaper publishing, Park Row (1952). Fuller started as a copy boy in his early teens before becoming a journalist at 17. Gene Evans, a bear of a man in other Fuller films like The Steel Helmet (1951), looks lean and hungry as the fictional Globe publisher Phineas Mitchell. Sexual tension between the incorruptible Mitchell and the wealthier Star publisher, Charity Hackett (Mary Welch), manifests itself onscreen as a circulation war. The competition reaches its apotheosis in a dynamic sequence in which violent thugs hired by the Star start tearing down the Globe's newsstands. The shot begins in the local bar, as a man comes in screaming to Mitchell about the Star's thugs before both men and a few others spill out onto Park Row. Amidst all the bedlam, the camera continues to track with Evans as he punches his way to the Globe's editorial office to enlist even more help. All of it is done in one extended take on a block-long replica of the famous street, each of its buildings' interiors an actual working set. Fuller's sensationalistic style is perfect for this film, one in which he suppresses his usual cynicism in order to pay tribute to the Fourth Estate. The Halliday Brand (1957) is by another B-movie auteur, Joseph H. Lewis. It's a fascinating Western, once you are able to suspend your disbelief enough to deal with Joseph Cotten playing Ward Bond's son (despite only a two-year age difference). Invested with not a small bit of style by Lewis (nicknamed "Wagon Wheel Joe" for his ability to add visual interest to any oater by shooting much of it through foreground objects like a wagon wheel), The Halliday Brand tells its story of a father-son feud in flashback. The two actors allow their real-life political views to seep in to the scenario with Cotten defending the very notion of civil rights against his father, Bond's right-wing sheriff. This is prompted by the sheriff's looking the other way as a lynch mob hangs a man (of mixed Native American heritage) wrongly accused of rustling cattle. Lewis (Gun Crazy) makes much out of his very low budget by going in for tight close-ups and using audio effects and shadows on walls to not only enhance the drama, but to make it appear as if a giant lynch mob corners the accused instead of just a few actors. Cotten accuses his father of allowing the execution because the racist Bond discovered the victim was romantically involved with his daughter (Betsy Blair). With the crackling quick pace in which Lewis reaches his powerful finale, and the easy layering of familial melodrama into the topical Western, it's easy to see how the director transitioned into directing TV Western family sagas like The Rifleman, Bonanza, and The Big Valley. It's another DVD worth adding to your collection. Less imaginative with his low budget is Delbert Mann (Marty) who directs the TV movie April Morning (1986). Based on Howard Fast's young adult novel, April Morning stars Chad Lowe as a boy who comes of age in 1775, just as the first shots of the Revolutionary War are fired. 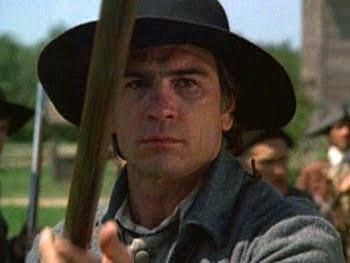 His relationship with his demanding father, Tommy Lee Jones, is resolved over the course of the story, as he is forced to turn to other patriarchal figures (Robert Urich and Rip Torn) after his dad falls in the field of battle. While the story is catnip to American history buffs like me, Mann's execution leaves a lot to be desired. Lacking tight visual compositions like those of Lewis, the battle scenes are shot at a distance, betraying the limitations of the telefilm's low budget. What might have seemed like many troops now only look like a handful of soldiers. Stuntmen wear ill-fitting wigs and costumes which, when wedded to some rather amateurish stuntwork, recalls a national park reenactment more than it does an effective battle scene like those in Roland Emmerich's The Patriot (2000) or even Hugh Hudson's disappointing Revolution (1985). Sadder still? 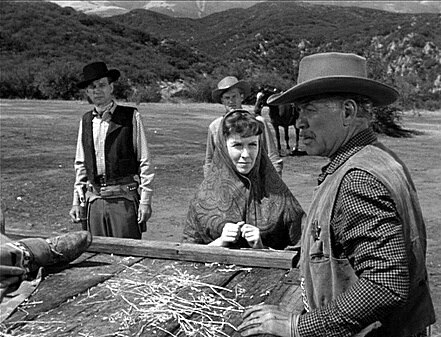 Discovering that April Morning was a project the great John Ford was mounting at the time of his death (John Wayne would have played Jones's part). Speaking of favorite filmmakers, one of the reasons I selected Haunted Summer (1988) for review was because its director, Ivan Passer, made one of my very favorite films, Cutter's Way (1981). As subversive a film noir as that film was, Haunted Summer is a staid, overly bucolic look at the hallucinatory holiday spent in Lake Como together by Lord Byron (Philip Anglim), Claire Clairmont (Laura Dern), John Polidori (Alex Winter), Percy Shelley (Eric Stoltz) and the future Mrs. Shelley, Mary Godwin (Alice Krige). It is devoid of any of the eroticism found in Ken Russell's far more satisfying, though batshit crazy, Gothic (1986), which also depicted a stylized version of the same events which generated such classics as Frankenstein, The Vampyre, as well as some classic poetry from the Romantic movement. 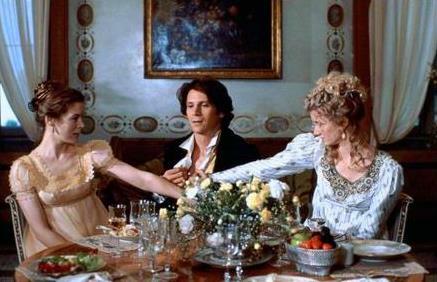 The Brat Pack-style cast doesn't stand up to Russell's ensemble (Gabriel Byrne, Natasha Richardson, Julian Sands, Timothy Spall), with the exception of Anglim (The Thorn Birds) and Krige (Chariots of Fire) who are fine as Byron and Godwin. 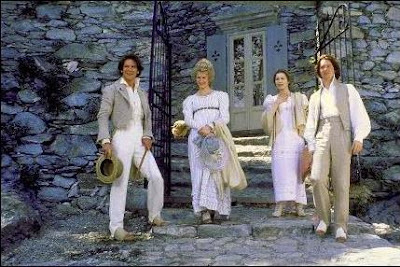 Also, the DVD is a faded, full frame edition, ruining what might have been the movie's only selling point, Giuseppe Rotunno's lush cinematography of the film's pastoral setting.